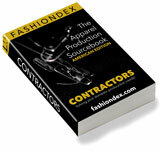 ADVANCE PLEATING & BUTTON CO. solving Trim Application production and contracting needs. Description: Contractor of textile trimmings. Compare ADVANCE PLEATING & BUTTON CO. with all 12 listings in Trim Application.